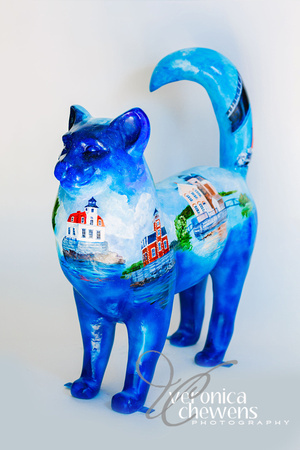 Description: This kitty sports the lighthouses of the Hudson River – each of which is uniquely beautiful. Originally submitted in 2009, my original inspiration for this cat was my mother’s newly-found love for watercolor painting. 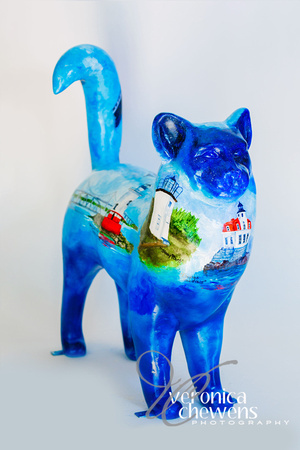 One of her favorite subjects to paint is lighthouses, and she does it beautifully. If you look closely, you may even ﬁnd “Kipsy”, the infamous river monster of the Hudson. About the Artist: Sabine was born in Berlin, Germany and immigrated to the United States with her family at the age of five, settling in New York State. She’s always loved to draw and over the years, developed an interest in the medical and scientific branch of illustration. So she decided to be traditionally trained in art, and majored in medical illustration, receiving a Bachelor of Science in Applied Arts from Pace University, and did her Masters studies in Art and Art Therapy at New York University. Subsequently, Sabine worked as an illustrator and designer in the medical and pharmaceutical advertising fields for over 30 years. But she has equally persisted in pursuing her creative passion as a a fine artist and teacher. Over the years, her work has been honored with awards, and has been shown in such prestigious places as the Hudson River Museum of Art, at the Briarcliff Gallery at Pace University, as well as at the Andre Shellingburger Gallery in California. In addition, many of her illustrations have been published in medical journals and other advertising vehicles such as ads, brochures, research papers, books and videos. After moving to Colorado, in June of 2002, Sabine exhibited for the first time at the Pagosa Springs CO Arts Council Gallery, and then had a one-woman show in September 2003, and again in 2010 with A. John Graves and their Animal Verses for GrownUp Children book and illustrations. 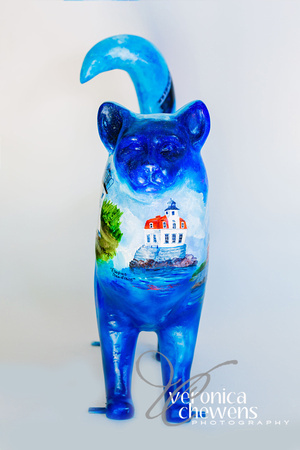 Her work has been in the calendars, commissioned public art events, several local and national galleries, as well as private collections around the country. Sabine has been a commissioned artist for several public art projects, including the 2005 San Juan Mountains Association Pumas on Parade project, the 2006 International Parade of Cows – Denver event, and the Cat’n Around Catskill project annually since 2007 (she is the most requested artist for this project, commissioned for 26 kitties to date!) Several years ago, she published a collaborative book, with author A.John Graves, a coffee table book of humorous adult animal verses, entitled Animal Verses for Grown-Up Children, which is for sale through the her or online at www.blurb.com. As a career professional artist and designer, she is currently teaching painting and illustration privately, works as a graphic designer and serves as President of the Evans, NY Art Guild.